That's a wrap on the 2018 football season, folks! Just because the season's over, that doesn't mean you should stop learning from it. Here are some surprising fantasy stats about the year that saw Pat Mahomes' breakout, Le'Veon Bell's holdout, and Derrick Henry's record-breaking resurgence. Use these nuggets of information to help secure a championship in 2019! Note: The following stats are based on PPR formats. What do Drew Brees, Russell Wilson, and Dak Prescott have in common? In case you missed the giant, bolded hint above, they're the only three quarterbacks who managed to finish inside the Top 10 at the quarterback position both of the last two seasons. And all three just barely managed the feat this year, finishing as QB8, QB9, and QB10 respectively. Brees has been by far the most consistent QB in fantasy football for well over a decade. I mentioned a version of this in last year's Fun Facts article, but it bears repeating: Brees has only fallen outside the Top 5 QBs once since 2005. Even more ridiculous? Since officially taking over from Doug Flutie in 2004, Brees has never fallen below QB12. Never. 2019 Impact: If Brees decides to keep playing next year -- he turned 40 in January -- he could once again be the safest QB pick on the board. Especially if he remains outside the Top 5 QBs in ADP. Fitzmagic enjoyed by far the greatest per game numbers of his career, finishing as the QB5 on the year using that metric. And this includes the multiple games where he played basically one half, either getting benched for Jameis Winston or getting put on the field because Winston was benched. 2019 Impact: Don't be surprised if Fitzpatrick somehow finds himself onto the field again in 2019. He's a free agent, but the Bucs could hang onto him as a "Break In Case of Emergency" option with a proven track record. What Fitzpatrick was able to do in limited starts as a backup shouldn't go unnoticed, and he could once again be a viable streaming option next year. In his 5 regular season starts, Foles put up a paltry 15.0 fantasy points per game. That's worse than Josh Allen, Andy Dalton, Joe Flacco, Eli Manning, and Matt Barkley performed on a per game basis. Flash back to 2017, and Foles' 3 regular season starts netted him a cool 11.2 fantasy points per game. That number was below Jay Cutler, Jacoby Brissett, Blaine Gabbert, Trevor Siemian, Brock Osweiler, and was tied with Brett Hundley. 2019 Impact: If Foles does end up getting traded into a starting spot, you may not want any part of him for fantasy purposes. If you have him on your dynasty squad, now would be a good time to sell. Rushing for 697 yards on the season while starting just 7 regular season games is an impressive feat. Doing so as a quarterback is straight up bonkers. Jackson averaged 79 yards on the ground in those 7 starts, and added 4 rushing touchdowns for good measure. Using those 7 games, he was on pace for 1,257 yards rushing over a full season. Not only did Baltimore's rookie quarterback out-rush all others at his position, he put up more yards on the ground than Mark Ingram, Leonard Fournette, Isaiah Crowell, Kerryon Johnson, Dalvin Cook, Carlos Hyde, Kenyan Drake, Dion Lewis, LeSean McCoy, and Alex Collins. These people, you might have noticed, are all actual running backs. 2019 Impact: It's hard to get a better floor than what Jackson provided in 2018. If the torch is finally and officially passed from Joe Flacco, Jackson could be one of the safest plays at the position due solely to his usage in the run game. Does that sound impressive? Or...sad? Regardless, rookie QB Josh Allen was the leading rusher on the Bills squad by a wide margin. Allen put up a solid 631 yards with his legs, including 8 rushing touchdowns. Meanwhile, LeSean McCoy rushed for just 514 yards and 3 touchdowns. If that's not strange and depressing enough, McCoy played in 2 more games than Allen. Want more? Okay! Allen finished the year with 3 games of at least 99 yards rushing. McCoy did that just once. Basically, the 30-year-old running back hit a brick wall, and the spry 22-year-old QB took it upon himself to carry his team up and over it. 2019 Impact: LeSean McCoy might finally be done. He notched a career low in nearly every major category and looked like he was running with molasses in his shoes. But Allen deserves some credit here as well, and he could carry a similar floor to Lamar Jackson next year. Welp, might as well beat the living hell out of this dead horse while we're standing around it. 2018 was a quiet resurgence for rushing quarterbacks, as evidenced by the fact that 3 different QBs found the end zone just as frequently as their "star" running backs. 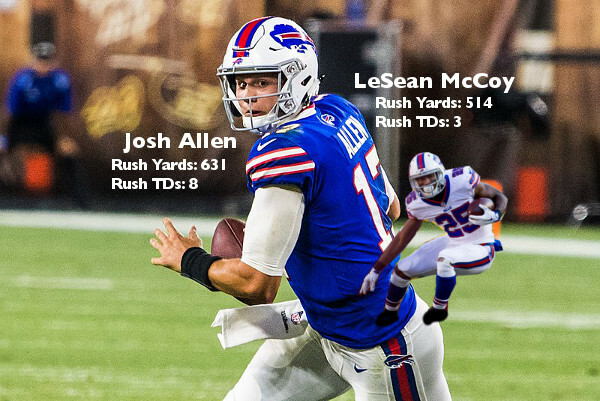 As previously mentioned, Josh Allen put up 5 more TDs on the ground than LeSean McCoy. Elsewhere, Dak Prescott equaled Ezekiel Elliott's 6 rushing touchdowns, and Deshaun Watson matched Lamar Miller's 5 end zone scampers. Considering that these are all considered "workhorse" running backs, that's a mighty interesting stat. 2019 Impact: Running quarterbacks have always been coveted in fantasy football, but those that can also find the end zone deserve special attention. All three QBs mentioned above have the versatility to keep fantasy owners happy moving forward. The notion that you want/need your fantasy running backs to come from "winning" teams was severely tested this year. Saquon Barkley, Christian McCaffrey, David Johnson, and Joe Mixon all came from teams with a losing record, and all of them put up RB1 numbers in PPR formats this year. Notably, Phillip Lindsay and Kenyan Drake just barely missed the cut, finishing as the RB13 and RB14, respectively. They both came from losing teams, as well. The key to running back success in fantasy football has always been volume. So long as your guy is guaranteed 15+ touches in a game, he should be fine even if he's not a standout talent. But typically your guy is only going to get that volume if his team is winning games OR if he's also a talented pass-catcher. Despite playing on an offense that was overly-accustomed to playing from behind this season, Saquon Barkley still managed to excel as a rookie running back. In fact, it was because the offense was constantly trailing that Barkley needed do so much damage through the air, racking up 91 receptions for 721 yards. To put that in context, those 721 yards helped him push past 2,000 total yards on the year. Those 91 receptions broke Reggie Bush's reception total for rookie running backs. Not too shabby. 2019 Impact: It's pretty much a guarantee that Barkley will fly off the board as the No. 1 running back next year. And considering what he did in the current Giants offense, it would seem there's nowhere to go but up. Barkley > Gurley in PPR formats? It certainly seems so. If you drafted David Johnson -- likely with one of the first five picks of your draft -- you probably don't feel like you got your money's worth from the Arizona running back. Regardless of Johnson's early failings, he managed to scrape together a below-the-radar Top 10 finish. And he did this despite finishing as a weekly Top 12 RB just twice. Johnson finished with more than 20 fantasy points in only three games this year. Back in 2016, his last healthy season, Johnson racked up 11 such games. You didn't get 2016 production out of David Johnson this year, but the topsy-turvy nature of the running back landscape still netted him the No. 9 spot at the end of the year. 2019 Impact: Johnson was stuck in an uninspired offense with a rookie quarterback still learning the ropes, but he received the 3rd-most rushing attempts of any running back, which helped balance things out. Even if DJ once again gets nothing but runs straight up the middle next year, he's still a safe option who may be had for a steep discount in next year's draft. With all the talk of Saquon Barkley's jaw-dropping rookie year, what gets overlooked is just how incredibly Browns' running back and fellow rookie Nick Chubb performed this year. While Chubb was technically 4 yards shy of a cool thousand, the fact that he put up that number while playing second fiddle to Carlos Hyde for the first half of the season is mind-boggling. If he'd had a full season as the lead dog -- perhaps if Cleveland brass had moved on from Hue Jackson on a more reasonable timeline -- Chubb would be in contention for Rookie of the Year honors. Even still, an RB17 finish with only half of a season to work with deserves more kudos. 2019 Impact: Chubb is the real deal, and I fully expect him to be coveted as an RB1 next year. If he falls to the mid-or-low 2nd round, Chubb will be an absolute steal. Like a hibernating bear roused awake by the promise of Charmin Ultra Soft toilet paper (those commercials just get me), it took Derrick Henry a good long time to finally reach his full potential. But then he steamrolled his way through the competition. Though pretty well useless for your fantasy squad for the first 13 weeks of the season, if you somehow had the foresight (or sheer stubbornness) to keep him on your roster, you were served one of the finest fantasy playoff performances of the last decade. Henry averaged an unreal 31.4 fantasy points per game when it counted the most. 2019 Impact: Henry's short career paints him as a fits-and-spurts sort of running back, incapable of providing consistent fantasy value. Recency bias will skyrocket his perceived value, so I'd be selling him in dynasty. However, if he makes it to the late 4th round in redraft leagues, I'd be willing to give him a shot in the hopes that Tennessee's new offensive coordinator can finally crack the code for making Henry a more consistent player. 300+ carries (not total touches) is a big workload for a running back these days, which is why the old workhorse RB model has largely died off. Ezekiel Elliott appears to be the last of this breed. And to his credit, he seems to handle it pretty well, as he averaged 4.7 yards per carry this season. Zeke was also the only back to carry the ball 300+ times in 2016, when he averaged 5.1 YPC. In 2017 -- when he served his 6-game suspension -- Elliott toted it for 242 attempts over 10 games, which put him on a full-season pace of 387. He averaged a career low 4.1 YPC that year. 2019 Impact: There's reason to be weary of the strain Zeke put on his body this year, and all the years before. Historically, players who have average at least 300 rushing attempts per season hit a wall sooner than later. But Dallas is committed to the run game, and it's likely Jason Garrett feeds Zeke until the wheels fall off. He's a safe bet for another 300 carries (plus an increased pass-catching workload) and a high-end RB1 finish in 2019, so long as his body can hold up. "Next man up" is a tired phrase in football, thought it applied pretty heavily to this year's NFL backfields. There were plenty of injuries, trades, and off-field issues that kept supposed starters on the sidelines for huge chunks this year. Players like James Conner, Phillip Lindsay, T.J. Yeldon, Giovani Bernard, Damien Williams, Gus Edwards, and C.J. Anderson all stepped into lead roles and provided immediate value in fantasy. Excluding Week 17 -- when oodles of starters typically rest for various reasons -- there were 52 separate instances where obvious backups (i.e. not the 1B in backfield committees) put up RB1 level numbers. That means 27% of the Top 12 finishes came from backup or fill-in running backs. For reference, David Johnson finished in the Top 12 just 12% of the time. Oh, and there were also 3 times where a backup finished as THE top back in fantasy that week. 2019 Impact: I'm not going to say running backs don't matter, but it's very clear that opportunity matters just as much as talent in fantasy football. It doesn't matter where they were on the depth chart entering the season, if a running back gets guaranteed touches in a respectable offense, they deserve a spot in your lineup. It's obviously difficult to project which backups will eventually see the field, but once they get there, grab onto them and don't let go. Fantasy analysts like to say "You can't win your league in the draft." And while that's technically true, there was a lot more consistency in the upper echelons at each position than we're used to. Of the players who finished the season in the Top 12 at their position, 39 of those 48 players were already sitting in the Top 12 after Week 8. Yes, a handful of guys shot up the ranks later on -- for example, Dak Prescott was QB23 after Week 8, but finished the year as QB9 thanks in large part to Amari Cooper's arrival -- but in general, the top dogs held steady from start to finish. 2019 Impact: Very few top tier players hit a wall late in the season. It's a bit of an ambiguous stat, but dammit I thought it was incredibly interesting! Maybe it means fast starts aren't to be discredited by fantasy owners constantly looking for something "better" around the next corner? During the offseason, there was plenty of discussion about which Rams wide receiver you could trust, if any. General consensus had Brandin Cooks, Cooper Kupp, and Robert Woods all outside the Top 20 ADP for receivers, with Kupp outside the Top 30, and Woods falling all the way outside the Top 40. All three notched at least 16.2 points per game, enough for Top 20 finishes all-around using that metric. It goes to show that truly prolific offenses can sustain multiple first-rate receiving options, and few have proven that quite like Sean McVay's group this year. 2019 Impact: Unless the Rams trade for an elite tight end (they won't), you can expect more of the same next year. In redraft, I'm taking whichever receiver falls the furthest. After heating up down the stretch in 2017, Anderson was a ghost for the majority of his third season. Whether it was due to the quarterback change, his off-field issues, or simply the pains of being a New York Jet, Anderson was not a reliable fantasy asset for the first 13 weeks of football. In fact, he put up 50 yards or more just once during that stretch. 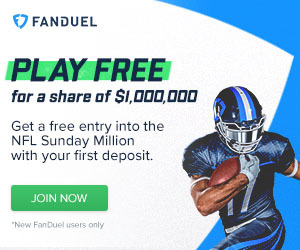 But Anderson punched the ignition switch HARD come Week 14, averaging 10 targets, 7 receptions, and 129 yards per game during the fantasy playoffs. He also scored a touchdown in each of those three outings. Only DeAndre Hopkins finished better than Anderson during your league's most crucial batch of games. 2019 Impact: Once continuity comes to the Jets' QB spot, Anderson should become less frustrating on a week-to-week basis. There's no reason he couldn't finish as at least a WR2 next year so long as Sam Darnold keeps progressing. Keep in mind, however, that Quincy Enunwa sat out weeks 15 and 16, when Anderson did most of his damage. There are still some lingering questions about how big of a role the lanky receiver can actually have in the Jets' offense. No other player in NFL history has hit that mark, with the closest being former Colts' great Marvin Harrison, who had 4 such consecutive seasons. Julio remains a yardage machine, but the fact that he finally broke his touchdown curse is what made him such a strong fantasy receiver this year. Five straight 1,400-yard seasons is a ridiculous feat, no matter how few touchdowns it results in. Julio finished WR6, WR2, WR6, WR7, and WR4 during that span, end zone catches be damned. 2019 Impact: There's no reason Julio Jones shouldn't be drafted as a Top 5 receiver again next year. With Antonio Brown's status as a Steeler in limbo, Jones could now be considered the 2nd-safest WR off the board next year, just behind DeAndre Hopkins. The Packers' disastrous offensive play didn't stop the team's No. 1 receiver from getting his in 2018. Adams hit 15 points or more in every single game he stepped onto the field for, which is how he ended up the WR1 on a per game basis this season. Including 2017, Adams has scored at least 15 points in 23 out of the 29 games he's played. The fifth-year wideout has been one of -- if not THE -- most consistent receivers in fantasy football for these past two seasons. 2019 Impact: There's at least an argument to be made for Davante Adams being the first receiver off the board in drafts next year. Of course, with Green Bay undergoing significant changes to the coaching regime, it's uncertain how they'll utilize Aaron Rodgers' current go-to target. Nearly 1 out of every 4 passes caught by Mike Williams resulted in a touchdown. That kind of touchdown efficiency is almost unheard of. It makes sense when you realize that 21% of Williams' targets came inside the red zone, and 6 of his 10 touchdowns came from within the 10-yard line. But still...holy cannoli. A few other players had even more impressive touchdown-to-reception ratios -- including John Ross (33%) and Jaron Brown (36%) -- but neither of them had even 25 catches on the season. 2019 Impact: Touchdown regression is coming for Mike Williams. The Chargers were without Hunter Henry, who is bound to eat into some of Williams' red zone work. That's not to say Williams can't be productive next year, but he'll likely need more than the meager 66 targets he received in 2018 to do so. Yeah. You read that right. 2 out of every 3 times New England fullback James Develin ran the ball, he scored a touchdown. Granted, he only ran the ball 6 times all season. And all 6 of those rushes came within the 5-yard line. So there's that. 2019 Impact: It's the Patriots. Develin could be New England's leading rusher next year or he could be cut from the team this offseason. Neither move would surprise me. I can't see him as a viable draft option in 2019. Still an impressive stat, though. This may not seem like a big deal at first glance, but it hasn't happened since 2010 when Aaron Hernandez, Rob Gronkowski, and Jermaine Gresham accomplished the feat. This year it was Chris Herndon, Mark Andrews, and Dallas Goedert challenging the notion that rookie tight ends don't produce out of the gate. Now, I know none of those names really jump off the page as "fantasy studs." Because let's face it, their presence in the Top 20 has less to do with their individual output than it does the complete dearth of relevant tight ends in 2018. 2019 Impact: Keep an eye on all three of the names listed above, as it's possible they all take a sophomore jump in 2019. That said, much is in-flux with the Jets, Ravens, and Eagles, so I wouldn't consider any of them "must drafts" next year. I also don't believe their relative production this season belays a trend in regards to upcoming rookie tight ends. Don't overvalue the incoming TE draft class. Oof. What a disappointing season for the usually-dominant tight ends. Most egregious, of course, is Rob Gronkowski. No one could have predicted that a healthy-ish Gronk would make just 5 appearances inside the Top 15 this season. His recorded the 3rd-lowest targets per game, 2nd-lowest yards per game, and absolute lowest touchdowns per game of his career. But Gronk wasn't the only disappointment. Jimmy Graham and Greg Olsen, with ADPs of TE4 and TE5 respectively, finished as the TE12 and TE25 on the season. Granted, Olsen was rarely healthy, but even when he was, it was clear Christian McCaffrey was Cam Newton's new favorite mid-field target. As for Jimmy Graham? Apparently the Green Bay curse continues for tight ends. 2019 Impact: Gronk might very well retire for real this offseason, but if he comes back for one more season, I'm not drafting him unless he falls to the 5th round. If Graham sticks around Green Bay, he'll fall off my draft board entirely. Olsen will likely make the transition to the commentator booth, but he's a big DO NOT DRAFT for me if he plays. The Jaguars may have been the top fantasy defense last year, but they fell outside the top half this season. The Eagles were a Top 3 defense in 2017, but didn't crack the Top 15 this time around. The Chargers, Lions, Panthers, and Chiefs all dropped off a cliff as well. Meanwhile, the Texans rose from the ashes, jumping from #25 in 2017 to #3 in 2018. Similarly, the Colts improved by 12 spots to crack the Top 10 this year. 2019 Impact: Think about this next year when you're on the board in Round 8 and Chicago's D/ST is sitting there, taunting you. Sure, maybe Chicago will dominate fantasy scoreboards again in 2019. But how early are you willing to roll those dice? Just when I was all ready to pen my yearly reminder to fantasy football owners everywhere that KICKERS CANNOT BE TRUSTED, I stumbled across this statistic. I am both humbled and exasperated that we've finally seen some year-to-year consistency at the position. Sidenote: #10 from last year, Kai Forbath, wasn't the starting kicker on an NFL squad at the start of the year, so he wasn't being drafted in your fantasy league. So really, this could have been an even more consistent year for kickers. Woof. 2019 Impact: If you're looking for kicker impact, you're still doing this wrong. But hey, maybe it's not a bad idea to take a Top 10 guy from 2018 in next year's draft if he's still there in the last round. Thank you for trusting Fantasy Knuckleheads to guide you through the 2018 fantasy football season. We're working on ways to provide even more content and advice for the 2019 season, so stay tuned!